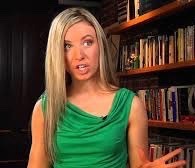 Katie Kieffer is a self-described millennial (and apparently counted as a spokesperson for millenials among people leaning religious right – she doesn’t seem to mind), columnist at Townhall, author of Let’s Be Clear and in general something of an Ann Coulter wannabe. Ann Coulter is not a good role model. At the 2013 CPAC panel on women’s issues (CPAC banned a gay group from participating, but could at least pretend to discuss women’s issues) Kieffer called Obamacare “sexist” because it expanded access to birth control, which she believes lets men get women pregnant or give women STDs without feeling any responsibility. “Obamacare is sexist because it puts guys off the hook,” Kieffer explained, “all he has to do is say, oh that’s not my fault you should have been using Obama’s free birth control.” We don’t think further comment is needed. Apparently she is sometimes described as a “libertarian” by religious fundamentalism characters who have deluded them into thinking that Bible-based social conservatism is libertarian. Kieffer supported Ted Cruz during the 2016 primaries. Diagnosis: Not entirely unlikely to emerge as a Fox News anchor in the relatively near future. Yeah, that kind.